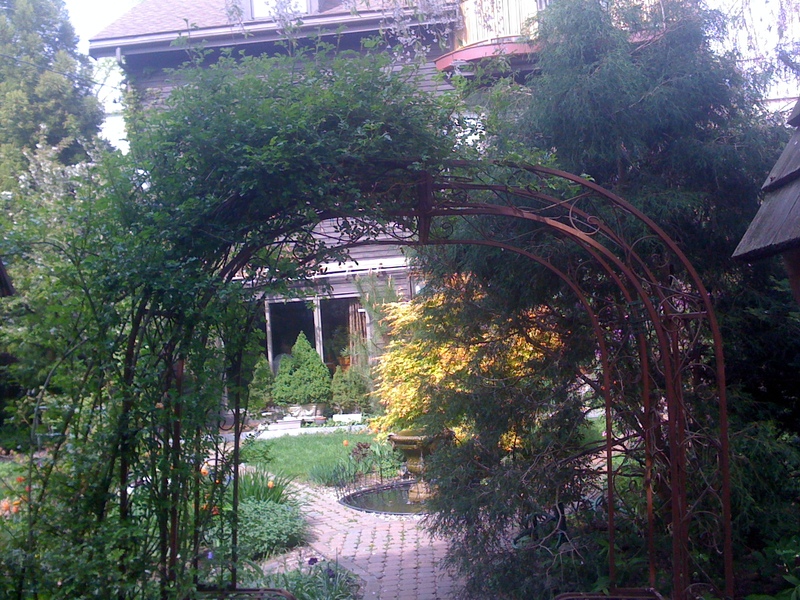 Near the top of my long list of things to do and see in Cambridge before we return home was to spend an afternoon touring the neighborhood of longtime Cantabrigian Jan Gardner, who helps edit Nieman Reports. A former Boston Glober who still writes the paper’s Sunday Shelf Life books column (and did a fabulous interview last week with recent Pulitzer winner Paul Harding, whose “Tinkers” I’m dying to read), Jan took me on a two-hour walking tour of a community that turned out to be much more interesting that its name: Area 4. Somewhere betwixt Central and Inman squares, Jan’s house is located around the corner from The Lost Sock Laundromat. It also sits smack-dab between a former VFW Hall that’s been refashioned into a mosque and a Jewish synagogue, and — get this — the two disparate congregations collaborate to feed the needy. 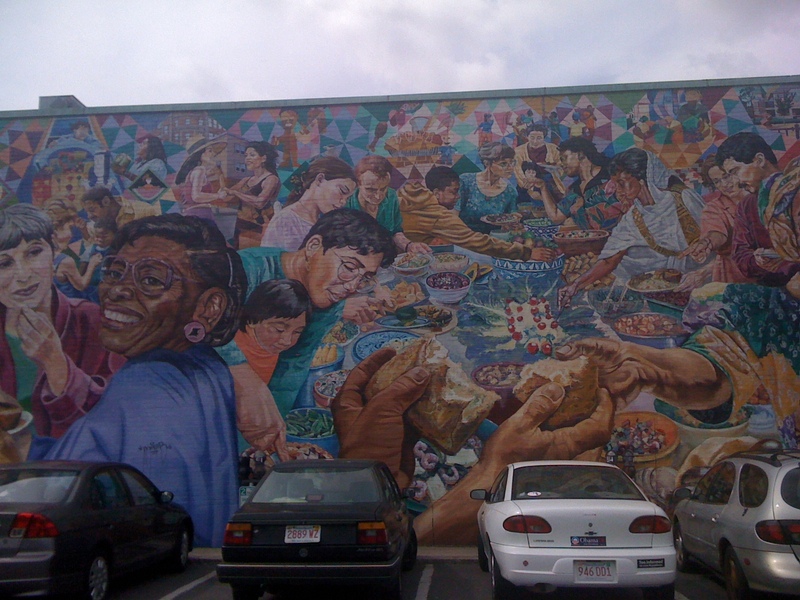 Arriving on foot at Central Square, we began by checking out some of the city’s colorful murals, including this one, painted on the side of Harvest Co-op Markets. A few blocks away Jan told me the story of Keezer’s (alas, it was closed), a longstanding used-clothing store specializing in suits. Presidents JFK and FDR were said to have consigned some of their formal wear at the end of the Harvard school year to score some summer-break cash. Had they been in the Nieman program, they’d have been trading them in for suits of a bigger size. I’ve written before about Cantabrigians’ tendency to load their sidewalks on Sundays with freebie giveaways (in anticipation of Monday trash day), and here Area 4 did not disappoint. We soon ran into an old writer buddy of Jan’s named Bruce, who was found looking through an assortment of old suits and menswear. (Don’t know why the original owners didn’t take them to Keezer’s instead.) 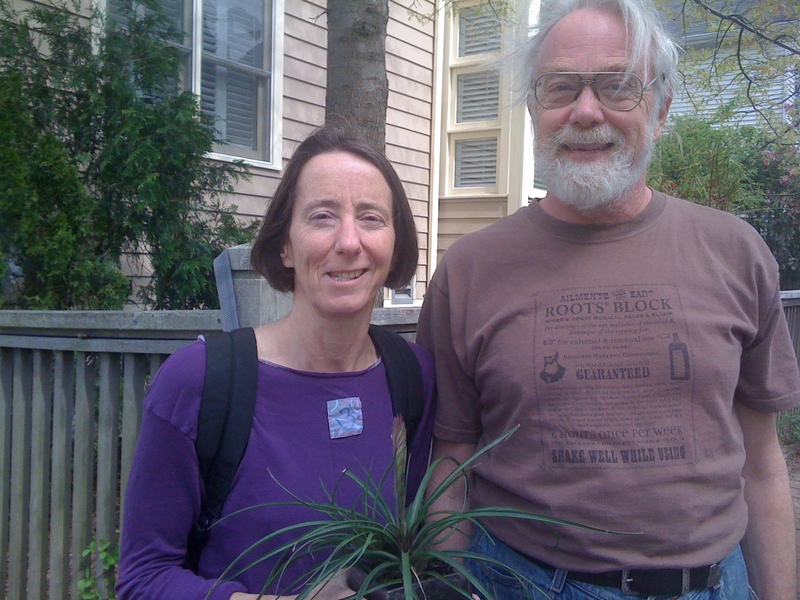 I’m not into suits, but I did manage to nab the very cool houseplant that Jan’s holding for me in the above photo. 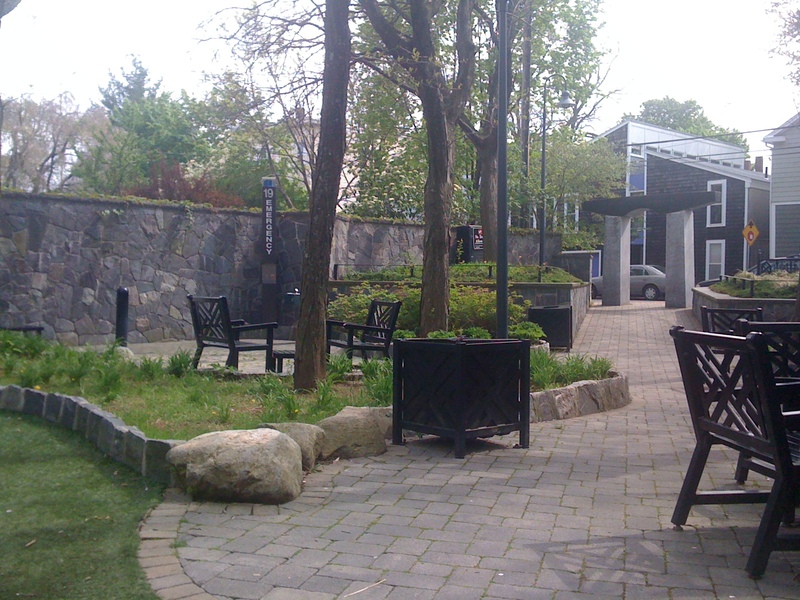 We spent the rest of our walk nudging into cozy garden spaces, including this gloriously small Franklin Street Park with its Zenlike granite entranceway shaped in the sign of pi, with a wonderful glider for a bench. 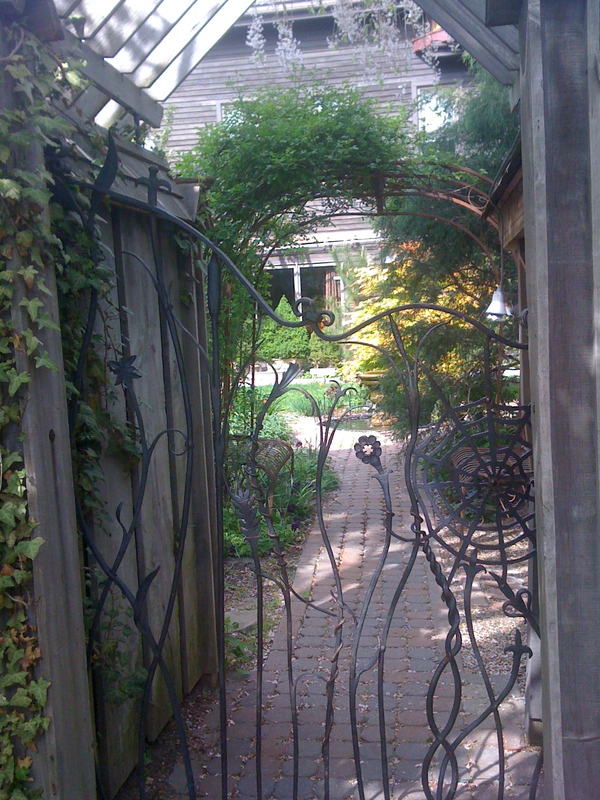 Down the street we admired a hand-forged wrought-iron gate adorning a front-garden fence, with peek holes for the nosy gardener in me. We wandered into a nearby Open House for the heck of it (gorgeous, but a 2,000 square feet condo — for sale at $800,000!) and, yes, the realtor informed us, an offer had already been accepted. 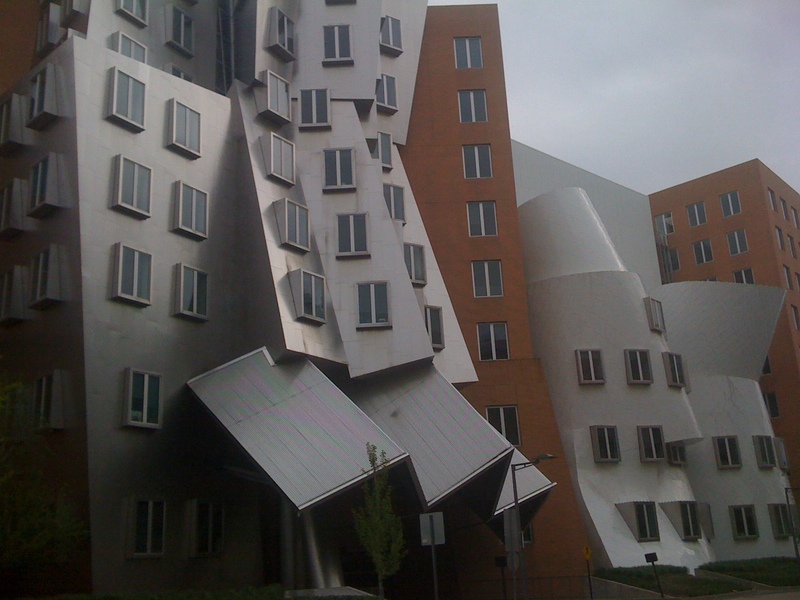 After an arm-length spinach-mozzarella dosa at The Dosa Factory in Central Square, we capped things off with a short drive to MIT so Jan could show me the $283 million Stata Center, a Frank Gehry-designed Seuss-ism that makes Roanoke’s new $66 million Taubman Museum look like my four-square house in comparison. Architecturally, modern MIT feels a world away from the rest of Cambridge, with its buckled brick sidewalks and cozy crannies and signs proclaiming that In 1649 Something Very Special Happened Here. There are so many irresistible places to explore here, I’m sure I’ve only scratched the surface. But I know this: I’ll miss it like crazy. And I haven’t even made my way yet to the new Lord Hobo, the mecca of craft beer, with 40 different kinds on tap.